Topics: Cnmd, Mrc Review Documents, Uk Translational Research Conference, and Studentships. 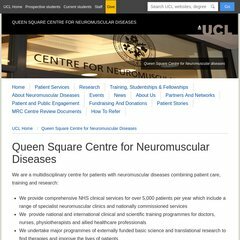 cnmd.ac.uk MRC Centre for Neuromuscular Diseases at the UCL Institute of ..
cnmd.ac.uk MRC CENTRE FOR NEUROMUSCULAR DISEASES -UNIVERSITY COLLEGE LONDON .. The estimated 26 daily visitors, each view 13.00 pages on average. Its 2 nameservers are bas-a.bcc.ac.uk, and link-1.ts.bcc.ac.uk. It is hosted by The Bloomsbury Computing Consortium (England, London,) using Zope/ web server. Its IP Number is 144.82.111.23.